“It was a great feeling to have everyone shake my hand,” said Jeffcoat, who called it the highlight of his years with the Cubs.3 Thus began the sudden transformation at the major-league level of a speedy, strong-armed, outfielder into a solid right-handed pitcher who would spend his last six seasons on the mound. Jeffcoat made his regular-season pitching debut in the Cubs’ opener on April 16. So unfamiliar was he with his new position that he took several strides toward the outfield on the first fly ball hit off him before he realized where he was.4 Still, he acquitted himself well, with two scoreless innings in relief, keeping the game close. The rest of the Chicago bullpen fared less well, as the Cincinnati Redlegs pounded the Cubs, 11-5, before just 17,271 fans at a rainy Wrigley Field.5 He became a reliable reliever for two seasons and, after being traded to the Redlegs, joined the Cincinnati rotation as a full-time starter in 1957. He finished his career back in the bullpen with the 1959 St. Louis Cardinals and a year at Triple A before hanging up his spikes. “Everybody played baseball back then,” said retired Navy Capt. John P. Jeffcoat, one of Hal’s three sons, of his father’s early years.7 Brother George was a heralded pitching prospect by the time Hal was old enough to play. George Jeffcoat went on to pitch in National League for the Brooklyn Dodgers and Boston Braves. Their father taught all four of sons to play as soon as they reached age 5. The couple married on January 14, 1946, in Lanesville, Massachusetts, Valma’s hometown. They lived there and in Gloucester in the offseason, where Jeffcoat worked at various times as a carpenter and as a stone mason and even delivered mail during the first few years of his major-league career.14 Harold G. Jeffcoat, the first of their three sons, was born in 1947 in Nashville, Tennessee, while his father was playing there. George Jeffcoat had pitched several seasons for the Double-A Nashville Volunteers in the Southern Association. He sent a telegram to Vols manager Larry Gilbert, who also owned the team, saying that he had a kid brother who “would be a great pitcher when he got out of the army.” Gilbert, who eventually signed Hal for $2,500,16 assumed that the younger Jeffcoat was what his brother said he was when the Army veteran reported to the Vols camp in Macon, Georgia, in the spring of 1946. “Skip, I’m not a pitcher,” Hal told Gilbert. “I’m a center fielder.”17 Although he was sent down to play for Class B Shelby in North Carolina for most of 1946, Jeffcoat backed up his claim to be a position player with a 35-game hitting streak and a .346 batting average in 1947. Always fast, Jeffcoat had 36 doubles and 13 triples, while knocking in 118 runs and excelling in center field. 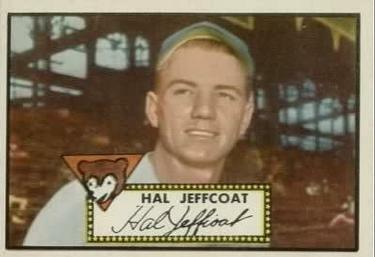 Following his success at Nashville, Jeffcoat was sold to the Cubs on January 16, 1948, for two Double-A prospects and an undisclosed amount of cash.18 Nashville was an independent minor-league team, but in practice acted as Chicago’s Double-A affiliate, with the Cubs having first rights to its best players. After making the Cubs out of spring training, Jeffcoat got off to a hot start in ’48. In early June he was hitting .323, good for eighth in the league. He also was impressing fans with his speed and arm in the outfield.19 His 11 assists from center field led the league. It was the first of four seasons in which he had 11 or more, topping out at 16 assists in 1952. The idea of pitching must never have been too far from the minds of those who watched Jeffcoat throw, even though he hadn’t pitched at all in 1947, or for the Cubs in the spring of ’48. “Hal Jeffcoat … is proving it was no mistake to make him over from a pitcher to an outfielder,” Jack Hand of the Associated Press wrote in late April 1948. “He went after so many high outside pitches that manager Charlie Grimm benched him,” wrote Raymond Johnson of The Tennessean in Nashville.23 Jeffcoat’s batting slump limited him to 388 plate appearances in 108 games, with a negative 0.1 wins above replacement (a retrospective statistic that didn’t exist when he played). He improved, however, after his recall and hit .275 the final two months of the season. Frankie Frisch, who had replaced Grimm in June, said after the season that he wanted Jeffcoat to work on his baserunning. “He’s got speed,” Frisch told Cubs beat writer Edgar Munzel. “He should be one of the league’s best base stealers.”24 In fact, Jeffcoat’s 12 steals had placed him third in the league in ’49. In the spring of 1951, team owner P.K. Wrigley had the Cubs train on Catalina Island, off the coast of Southern California. While there, some of the players participated in a series of rodeo-style events, with Jeffcoat winning the overall championship.27 Whether Catalina Island had any effect isn’t clear, but Jeffcoat had his best year at the plate since his rookie season. He was limited to 299 plate appearances, but hit .273. His 20 doubles – 26 of his 76 hits were for extra bases – helped him post a career-best .718 OPS (on-base-plus-slugging, a retrospective statistic). Caverretta, with slow-footed veterans playing left and right, was enamored of Jeffcoat’s defense. But as the ’52 season began with Hal getting just two hits in his first 32 at-bats, the manager was forced to bench him. He ended the year with a career-worst .219 batting average. “I still haven’t given up” on him, the manager said. “Jeffcoat’s hustle, speed, and determination make up for a lot of other shortcomings.” Hal also had the backing of Wid Matthews, the Cubs’ general manager (officially the director of player personnel), who praised Jeffcoat in a column by J.G. Taylor Spink of The Sporting News. Although his on-base percentage jumped 55 points to .314 in ’53, Jeffcoat was most often used as a defensive replacement, getting to the plate just 206 times in 106 games. Clearly, his major-league career was on shaky ground headed into the 1954 season. Scheffing finally managed to get Cavarretta to agree to let Hal, who was still working out as an outfielder, pitch in a spring-training game. Before that happened, Caverretta was fired. His replacement, Stan Hack, needed little convincing after Scheffing got him to watch Jeffcoat throw a bullpen session. “He showed me more stuff” than most of the other pitchers had, Hack said, “with his fastball, two varieties of curveball and a screwball.”32 The stage was set for Jeffcoat’s debut in the exhibition game played in New Orleans on April 7. He had to borrow a glove and use his regular spikes when he entered the game against the Orioles. His regular-season debut on April 16 at Wrigley was no walk in the park. The 5-foot-10 righty retired Reds left-handed sluggers Gus Bell and Ted Kluszewski during his two innings. Jeffcoat’s 1954 performance was uneven. He did get three starts that season and completed one of them. He notched seven saves, but he walked 58 batters in 104 innings and his earned-run average was 5.19. He went to Puerto Rico that fall to pitch in the winter league – on a team that featured Willie Mays – to refine his mound skills. It paid off. In 1955 he blossomed into one of the league’s top relievers. He pitched in 50 games – 49 in relief – and lowered his ERA to 2.95. His walks were still too high – although a league-leading 12 of them were intentional – but he rarely yielded the long ball – just 0.6 homers per 9 innings. He performed well in a swing role for the Redlegs. He went 7-1 and started 12 games in the season’s second half. Overall, he was 8-2, with two complete games and two saves. More importantly, his walks per nine innings were way down. In May 1957, however, Zimmer was quoted by Murray Robinson in The Sporting News as saying that he didn’t see the pitch that hit him “and it was an accident.”37 John Jeffcoat said his father told his mother on several occasions that that the pitch simply got away and that he did not mean to hit Zimmer. In the starting rotation for a solid Redlegs team in 1957, Jeffcoat was a 1-0 loser to the Braves in the season’s second game. He shut out the Braves on three hits through the first five innings before surrendering a homer to Hank Aaron in the sixth. But by the All-Star break, he had eight wins. Jeffcoat tossed his only complete-game shutout against the defending champion Dodgers at Ebbets Field on June 9, winning 3-0 on a six-hitter in the second game of a twin bill. A month earlier, two unearned runs had denied him a shutout on the same field, but he did win, 4-2. Although he stayed in the rotation all season, his performance indicated that the workload tired him in the second half. So in ’58, Tebbetts used him exclusively in relief, a practice Jimmy Dykes continued after replacing Tebbetts 104 games into the season. Jeffcoat responded with nine saves in 49 games and a career-best 1.360 WHIP (walks and hits per nine innings). Jeffcoat’s 1959 season started well enough. He had a 3.32 ERA in 17 relief outings and a save when he was traded to the Cardinals for 29-year-old Jim Brosnan, a deal that worked out much better for the Reds (the team went back to being “the Reds” in ’58). Although Jeffcoat thought pitching in the more spacious Busch Stadium would help him,40 it didn’t turn out that way. In just 11 games, his ERA was 9.17. The Cards released him in October. At 35, he gave it one more try with Seattle, the Reds’ Triple-A affiliate, in 1960, but the results weren’t there. His ERA was 6.38 after 17 games. He was out of baseball in 1961, but took over as manager of the Palatka Cubs in the Florida State League in 1962. Headed for a last-place finish and missing his growing sons, he left before the season ended, replaced by Rube Walker. When the majors expanded to Tampa Bay, Jeffcoat became a fan, son John said, although he didn’t attend many games. He was active in his church – Holy Trinity Lutheran – and held a number of lay-ministry positions for more than 50 years. His brother George, who died in 1978, had become a minister after his playing days. John Jeffcoat said he was proud that Ernie Banks, with whom his father played when Mr. Cub was rookie, recalled his dad as “a fine gentleman” on hearing of Hal Jeffcoat’s death on August 30, 2007.43 In 1998 Frank Robinson, who in his rookie season also played with Jeffcoat, said the former outfielder took 15 to 20 minutes every day helping Robinson learn how to play the tricky left-field Terrace in Cincinnati’s Crosley Field. Jeffcoat is buried in the Florida National Veterans Cemetery in Sumter County, Florida. He and his wife had been married for 61 years when he died. Valma Jeffcoat died in 2010 and was laid to rest next to her husband. 1 Edward Prell, “Cubs Win, 2-0; Jeffcoat Hurls 5 Innings,” Chicago Tribune, April 8, 1954: 63. 4 Edgar Munzel, “Hal Fourth Jeffcoat Brother on Mound,” The Sporting News, April 28, 1954: 3. 5 Prell, “Rain, Hit Showers Spoil Cub Opener, 11-5,” Chicago Tribune, April 16, 1954: 39. 6 Email from Harold G. Jeffcoat, February 21, 2017; obituary, St. Petersburg Times, October 1, 2007, accessed online February 16, 2017; telephone conversation with John P. Jeffcoat, February 16, 2017. 10 Ibid..; John Galloway, Montgomery (North Carolina) Herald, posted August 9, 2002; montgomeryherald.com/sports/article_58986c26-e0d6-11e1-a667. 11 Gary Bedingfield’s Baseball in Wartime, baseballinwartime.com/player_biographies/jeffcoat_hal.htm. 12 Email from Harold Jeffcoat; conversation with John Jeffcoat. 16 Associated Press, “2 of Cubs’ Kiddie Corps Making Grade,” Des Moines Register, May 6, 1948: 14. 17 Raymond Johnson, “One Man’s Opinion” Tennessean (Nashville), June 15, 1947: 45. 18 Unbylined news brief, “Cubs Purchase Hal Jeffcoat From Nashville,” The Tennessean, January 17, 1948: 7. 20 Conversation with John Jeffcoat. 21 Edgar Munzel, “Early Foot Cubs Find Center Field an Achilles Heel,” The Sporting News, May 5, 1952: 15; Edgar G. Brands, “Second-Division Players Top Rookie Team,” The Sporting News, October 27, 1948. 22 Associated Press, “Cubs Option Hal Jeffcoat to Angels,” Bloomington (Illinois) Pantagraph, June 7, 1949: 13; Associated Press, “Cubs Option Burgess, Recall Hal Jeffcoat,” Pantagraph, June 16, 194: 17. 24 Edgar Munzel, “Petunia Man Frisch Plans Strawberries,” The Sporting News, November 23, 1949: 13. 25 Hal Jeffcoat biography, Baseball Historian, baseballhistorian.com/players.cfm?lookieplayer+jeffcha01. 27 Edward Burns, “Enchanting Catalina, Isle of Fantastic Confusion and Cubs,” Chicago Tribune, March 25, 1951: 33. 29 Prell, “Cubs Win”; Associated Press, “Jeffcoat Turns Pitcher,” Decatur (Illinois) Daily Review, April 8, 1954: 45. 30 J.G. Taylor Spinks, “Looping the Loops: Cubs Upsurge Tribute to Wid,” The Sporting News, June 11, 1952: 4. 31 Bill Ford, “Bill Ford’s Notes,” Cincinnati, Enquirer, June 1, 1958: 59. 35 Tom Swope, “Hal Jeffcoat Balks at Trade, Then Decides to Join Reds,” The Sporting News, December 7, 1955: 21. 36 Tim Kurkjian, “Don Zimmer Simply Loved Baseball,” espn.com/mlb/story/_/id/11035595/don-zimmer-leaves-legacy-devotion-baseball-mlb, June 5, 2014. 37 Murray Robinson, “Don Zimmer, Frequent Target, Defends ‘Brushoff’ Pitches,“ The Sporting News, May 29, 1957: 11. 38 Jim Baker, “Exiting Stage Left,” baseballprospectus.com/artcle.php?articleID+7387, posted July 7, 2008. 39 Tom Swope, “Three-Year Mound Rise Under Tebbetts Buoys Reds’ Hopes,” The Sporting News, December 5, 1956: 11. 42 Denny Paterson, The Decaturian, student news site at Millikin (Illinois) University, February 13, 2013, http://decaturian.com/news/2013/02/13/president-harold-jeffcoat-retires-2/. 44 Michael Wagaman (Associated Press), “Giants Finally Get Some Offense in 10-7 Win Over Mets,” apnews.com/7f5582a0e7534c6a88ff5e552cec64aa, August 18, 2016.